The 2019 World Cup hosts England are one of the pre-tournament favourites considering they have been in good form lately. Playing at home has its fair share of advantages as well as disadvantages and the Three Lions will know it well. In the past two big ICC event in England, the 2013 Champions Trophy and the 2017 Champions Trophy, England reached the finals and the semis respectively only to be knocked out by the South Asian countries India and Pakistan. Can the hosts get third-time lucky-a lot of it will depend on the squad chosen for the job. Let us look at the 30 players who are in contention for the 2019 World Cup. ICC Cricket World Cup 2019 Schedule in PDF: Ticket Prices, Dates, Venue Details & Timetable Available for Download Online. Eoin Morgan: The English skipper is crucial for team’s batting in the middle order as well as leading the troops on the field. A destructive batsman who cans switch gears with ease, he will be a prize wicket for any opposition. Jason Roy: Surrey opener Jason Roy is in the form of his life and the English fans will have pinned high hopes on him to deliver in the World Cup. He is also in line to be picked for the Ashes owing to his good run with the bat. Joe Root: England’s best batsman and one of the modern-day greats, Joe Root carries the weight of the entire team’s batting on his shoulders. If he has a good World Cup, England can go all the way. 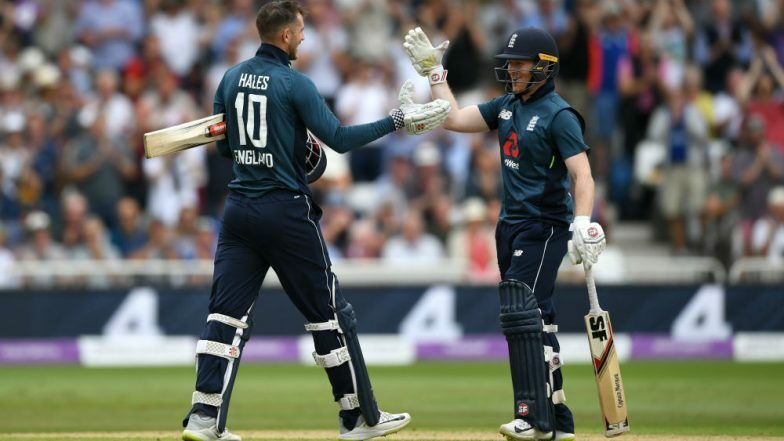 Alex Hales: Alex Hales is more of a T20 player who last played an ODI game in 2018 against Sri Lanka. But he could well be back to add more strength to the English batting. India Squad for ICC Cricket World Cup 2019: Here’s a Look at Indian Team’s Expected 30-Man Players List for the Mega Event in England. David Malan: He made an impressive hundred in the 2017/18 Ashes series but has been ignored by the selectors for the past year or so. A place in the 30 man probable list beckons though. James Vince: 28-year-old James Vince captains Hampshire in County cricket and could come in handy at the middle order if the team experiences quick fall of wickets. Joe Denly: Joe Denly had been impressive form recently against West Indies and there is an outside chance of him getting picked for the final World Cup squad. Ben Duckett: He was in the firing line on twitter recently after the whole Virat Kohli twitter incident and although his chances of making the World Cup is remote, he is in the selectors' scheme of things. Liam Dawson: Dawson was a star in the Pakistan Super League held recently and is hoping his heroics will earn him a place in the England ODI team once again. Jonny Bairstow: English wicketkeeper Bairstow is a handy batsman who can be quite destructive as a floater in the batting order. Pakistan Squad for ICC Cricket World Cup 2019: Here’s a Look at PAK Team’s Expected 30-Man Players List for the Mega Event in England. Jos Butler: He can be used as a wicketkeeper or simply as a pure batsman such is his talent with the bat. One of the several players in the team with extremely good strike rate. Sam Billings: Sam Billings is well known for his imaginative shot selections which have made him a huge hit in T20 cricket. He has been an unused player in several England ODI series which means he is in the reckoning for a spot. Ben Stokes: Controversial all-rounder Ben Stokes will play every game at the World Cup if fit such is his importance in the team. David Willey: CSK’s David Wiley is more of a bowling all-rounder who has a good record in domestic cricket although we have not seen the best of him in an England shirt in terms of consistency. Tom Curran: English all-rounder Tom Curran stint with Surrey won him an England call-up and he looks a safe bet for World Cup squad. Sam Curran: Brother of Tom Curran, Sam will provide a tough competition to him for the all-rounder’s tag in the team. He has only played two ODI games so far which might go against him. Moeen Ali: Batting all-rounder Moeen Ali is quite a favourite of the English skippers as partnership breaking bowling option in addition to contribution with the bat. Chris Woakes: England’s premium fast bowler has a century of wickets in ODI cricket and will probably be the opening the bowling for the Three Lions in the World Cup. Stuart Broad: Stuart Broad may have not played ODI cricket for three years but the selectors just might consider him as a cover for one of the pacers as he is one of England’s greatest ever pacers. Liam Plunkett: Liam Plunkett started playing for England at a very young age and then got dropped. After several years he has made a comeback for good and is bound to be in the final squad. Jake Ball: Nottinghamshire fast bowler Jake Ball could be a good option on England pitches that always has something for the pacers. He could also bat a bit which is always handy. Mark Wood: Mark Wood with his delivering clocking 90 mph is sure pick in the England ODI squad but he can also go for plenty which is his negative aspect. ICC Cricket World Cup 2019 Warm-Up Matches Schedule: Check India’s Fixture Dates Against New Zealand and Bangladesh. Steve Finn: Steve Finn was part of the 2017 Champions Trophy squad as Chris Woakes was unfit and it seems he is once again a cover for one of the pacers. Craig Overton: The youngster may have played just a solitary ODI for his country but is certainly one for the future. If he does miss on the 2019 World Cup, he sure could be part of the next. Olly Stone: We have seen very little of Olly Stone in the 4 ODI game he has played for England and while he does make the 30, he has very little chance of making it to the final squad. Chris Jordan: He has played for a variety of teams in global cricket tournaments and is considered a T20 specialist but stated in the recent West Indies series of his desire to represent England in the World Cup. Toby Roland Jones: The bowler who won Middlesex a county championship after a period of 23 years back in 2017, Jones is a proven performer in domestic cricket. He could well be awarded a World Cup call up if his performances don’t drop. Tymal Mills: One of the well-known faces of global T20 leagues, Mills has not yet played ODI cricket for the Three Lions. He is fast and accurate and the selectors will be tempted to pick him in the team. Jofra Archer: Jofra Archer like Chris Jordan moved from the West Indies to play cricket in England and is fast turning into a bowling sensation. He is touted as the English wildcard for the World Cup. Adil Rashid: One of the select few spinners in the team, Rashid will be part of the playing eleven for the majority of the games. England has a proper balance in all the departments and the hosts are surely one of the favourites for the 2019 World Cup. Can they lift their maiden World Cup trophy?